When this personnel gains a skill he does not already have, he is attributes +1 until the end of the turn (limit +4). This card have been fully converted from 2E into 1E under OTF rules - please use Ten of Fifty from Broken Bow instead. 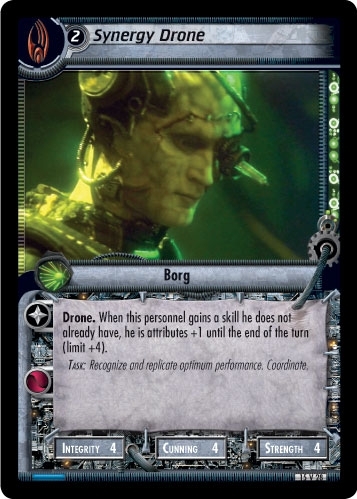 "Synergy Drone" is a backward compatible card form the Second Edition expansion The Undiscovered Country - ST1E compatible (by The Continuing Committee). See collectors infos for this card in the Second Edition section under the UCT-ID: ST2E 15 V 28.